I was in second or third grade. The day was chilly and overcast, with a sharp breeze. I was swinging by my legs on one of the parallel bars, with the back of my head facing the fence, watching some of my classmates play kickball. My head was probably a foot from the ground. I lost my grip, fell, and landed on my head. I remember that we were pretending to smoke right as I fell. I was knocked out, and was revived by a teacher. They didn't seem as frustrated with me this time (it wasn't the end of recess like when I was knocked out at the teeter totter) - I was asked to sit down and rest against the gym wall. Reluctantly, I obeyed. I was probably frustrated that I had fallen and now I had to sit and rest - it was like getting a double punishment! This is my last memory of playing on the parallel bars at New Middletown Elementary. 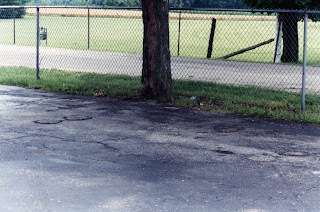 Something I have noticed recently is that there's a lot of blacktop in my old hometown. In Los Angeles (where I live now) it's all concrete - it feels nice to be on blacktop when I go back to visit - I remember on really hot days how soft the roads got - and I remember some dips in the roads where heavy trucks had pushed the road deep into the ground - patches show up clearly too... my favorite part about the blacktop is how shiny it gets after a rain - so shiny. Are you taking a yarn dyeing on this Saturday? The worst thing about teeter totters is when you accidentally slide off the end when you're "down", and it comes up and smacks you on the chin on its way "up". That was good for a few teeth for my older sister. How did we ever get out of childhood?